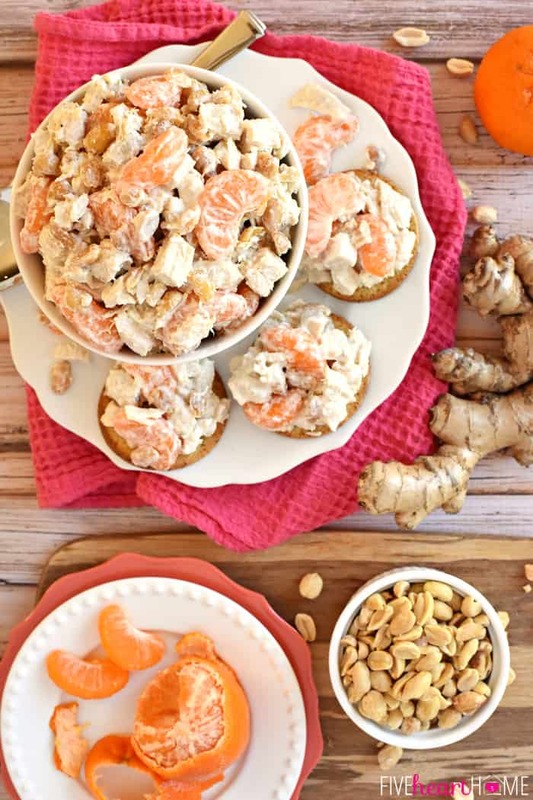 Flavored with fresh ginger and lightly sweetened with honey, this Asian spin on Sonoma Chicken Salad features juicy mandarin oranges and salty, crunchy peanuts. 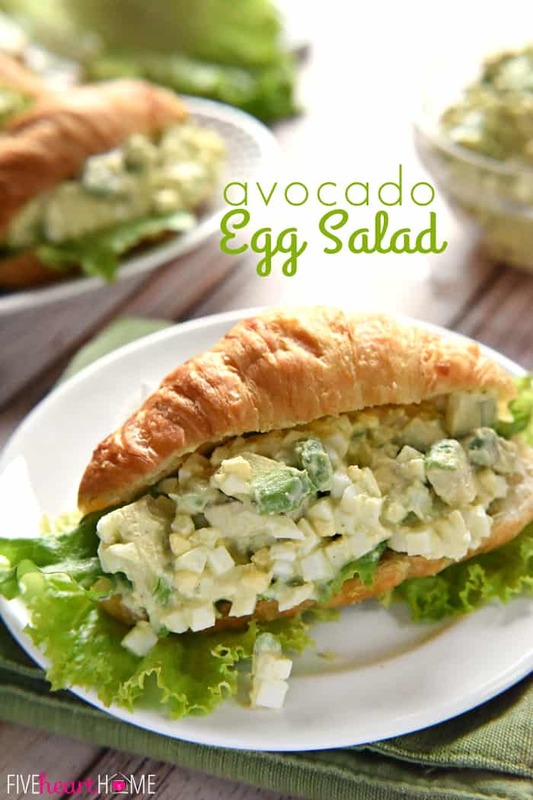 When warm weather hits, one of the first things I start to crave is chicken salad. 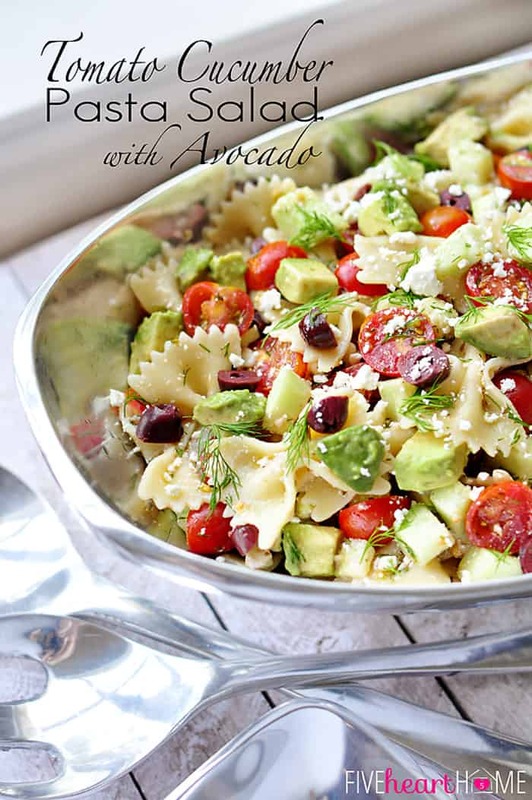 For some reason, it just screams spring and summer to me, and it’s one of my favorite things to serve (and eat!) at the baby and bridal showers that seem to abound at this time of year. 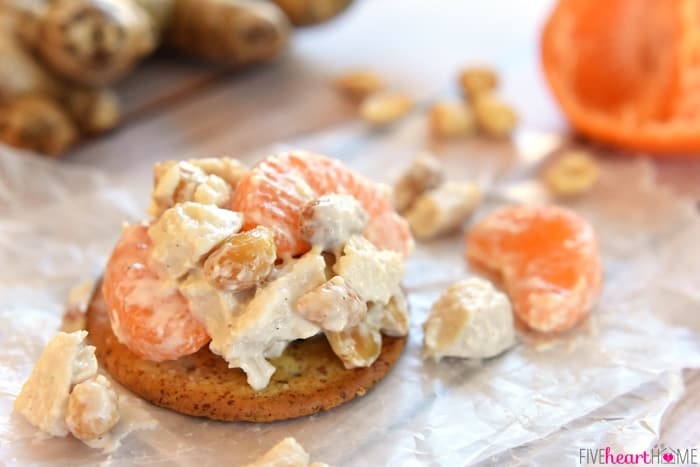 And while I love fruity, nutty, slightly sweet Sonoma Chicken Salad, I’ve had fun over the years playing with my basic recipe to create new and exciting variations. 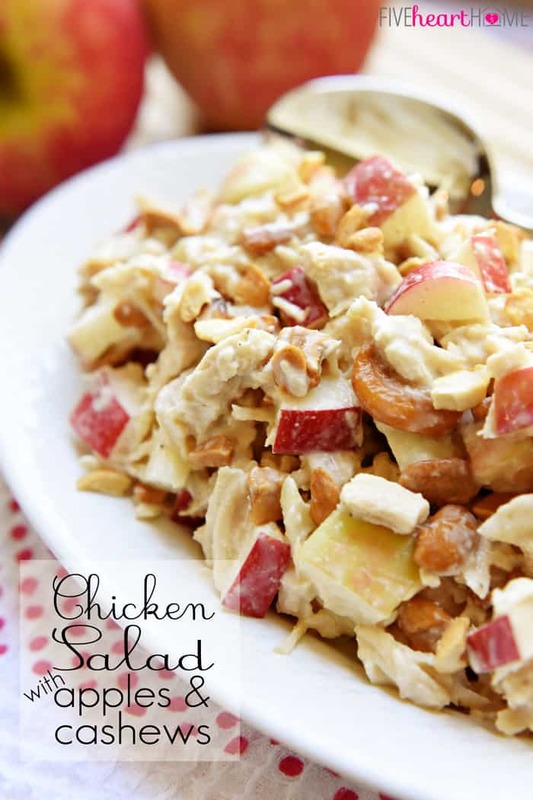 For instance, last fall I shared my Chicken Salad with Apples & Cashews, brimming with (you’ll never guess!) crispy apples and savory cashews. 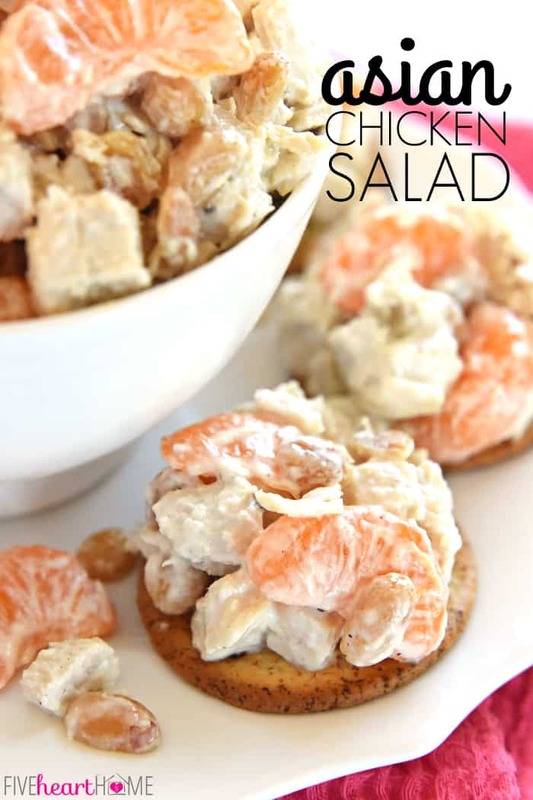 Well today, I’ve got yet another spin on things…Asian Chicken Salad! So what makes this chicken salad “Asian?“…you might be inquiring. Well, I’m so happy you asked! This chicken salad starts with a dressing that’s half mayo (for flavor), half Greek yogurt (to lighten things up), and sweetened with honey. But instead of using apple cider vinegar to lend a little twang (as I typically do when making chicken salad), this recipe calls for rice wine vinegar. And then, to up the Asian flavors even more, a few teaspoons of freshly grated ginger get stirred in. 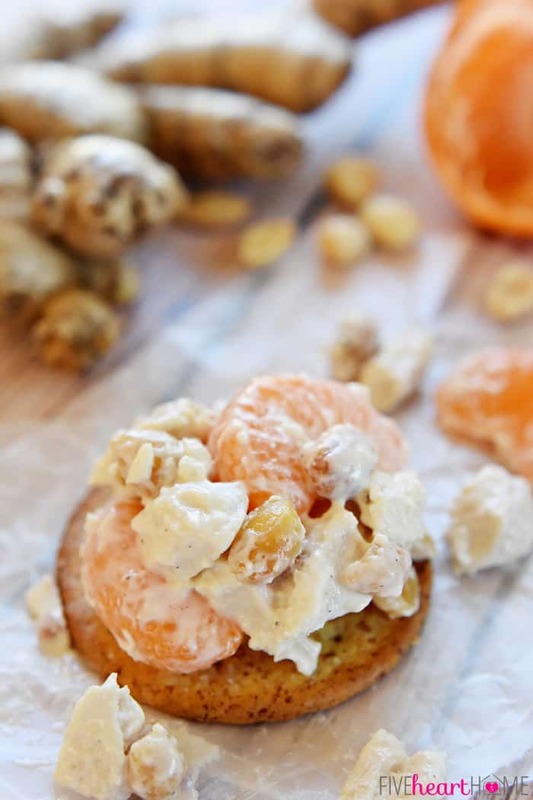 As for the fruit and nuts that are hallmarks of typical Sonoma Chicken Salad, this version calls for cute, sweet, mandarin orange segments and roasted peanuts, which lend a fantastic crunch. I recommend using fresh mandarins (or clementines, or tangerines), since canned orange segments are really soft and would likely fall apart in the salad. 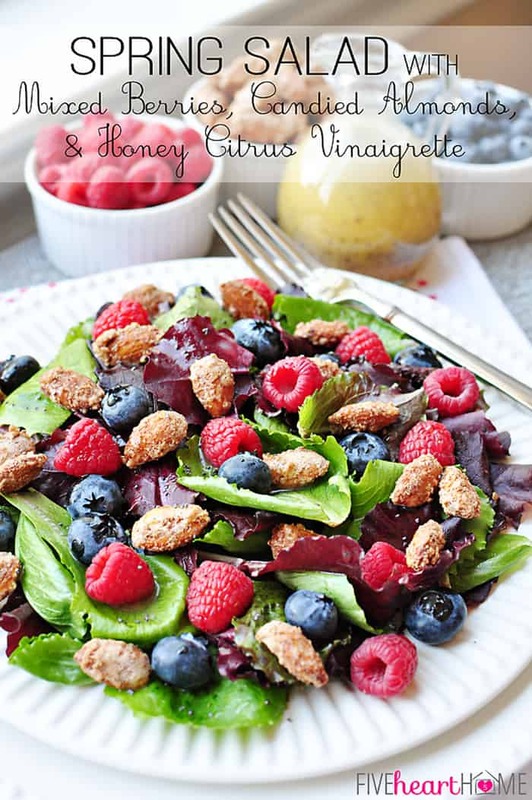 I also prefer using salted peanuts, since they nicely contrast with the honey-kissed dressing. But regardless of any liberties you take with the ingredient list, the different flavors and textures in this Asian Chicken Salad are sure to complement one another perfectly. So the next time you’re in a chicken salad kind of mood, I invite you to try this Asian twist on an old favorite! 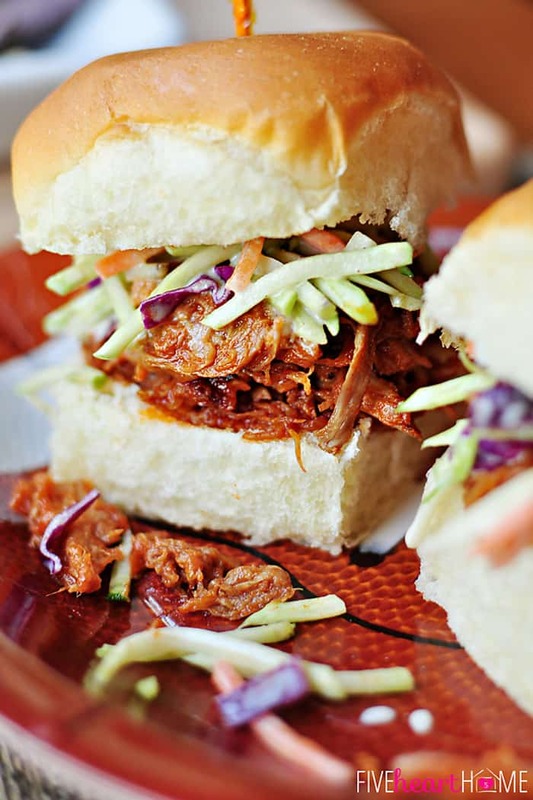 It’s refreshing over a bed of lettuce, it’s yummy on crackers, and it’s delightful on slider buns or croissants. Actually, it’s even pretty darn tasty if you inadvertently find yourself standing over the bowl with a spoon. 😉 Yup, regardless of your preferred vehicle for delivering it to your mouth, Asian Chicken Salad is sweet and salty, creamy and crunchy, and absolutely delicious. 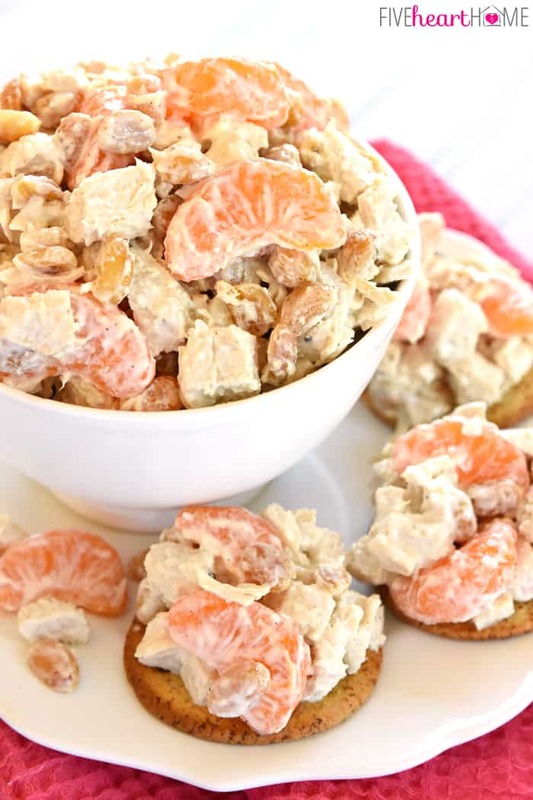 Flavored with fresh grated ginger and lightly sweetened with honey, this Asian spin on Sonoma Chicken Salad features juicy mandarin oranges and salty, crunchy peanuts. In a large bowl, whisk together mayonnaise, yogurt, rice wine vinegar, honey, fresh minced ginger, salt, and pepper until thoroughly combined. 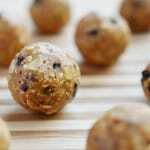 Cover and refrigerate until ready to use, for up to two days. To the bowl of dressing, add diced chicken, peanuts, and orange segments. Adjust seasonings, to taste. 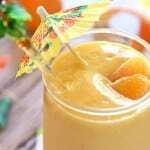 Refrigerate for at least an hour to chill and allow the flavors to blend. 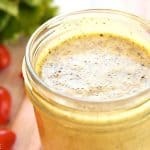 You may use all yogurt or mayonnaise if you prefer, but realize that doing so will affect the flavor of the dressing. Depending on how "ginger-y" you want your chicken salad, use slightly less or slightly more fresh ginger. I grate my ginger on a microplane, and freezing a small (peeled) segment of ginger for 30 minutes or so beforehand makes it easier to grate. Same thing goes for the honey...tweak it up or down depending on how sweet you like this type of chicken salad. Any small oranges will work. 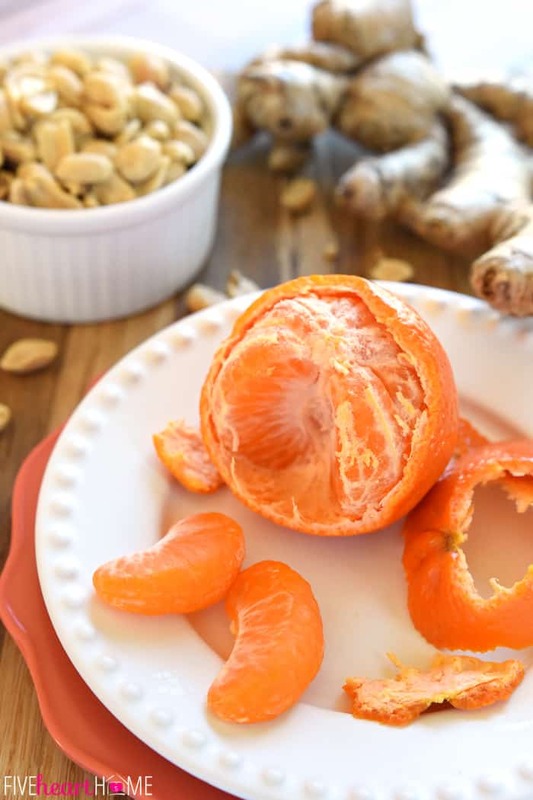 Clementines and tangerines are varietals of mandarins, so just use whatever you can find. About 4 to 5 small oranges should yield 2 cups of segments. 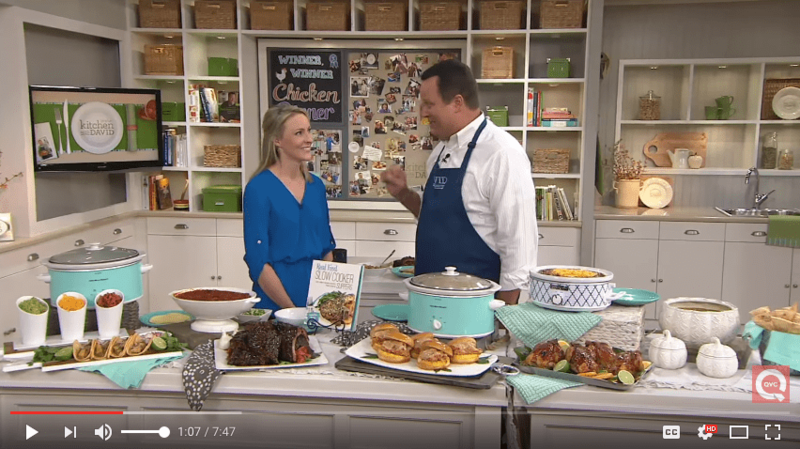 You may cook chicken using your favorite method (or use rotisserie chicken or leftover cooked chicken). Seasoned chicken (using at least salt & pepper) will give your chicken salad more flavor. You may dice it or shred it depending on your preferred chicken salad texture. 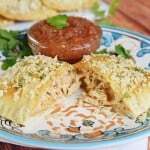 https://fivehearthome.com ~ All recipes and images on Five Heart Home are copyright protected. Please do not use without my permission. 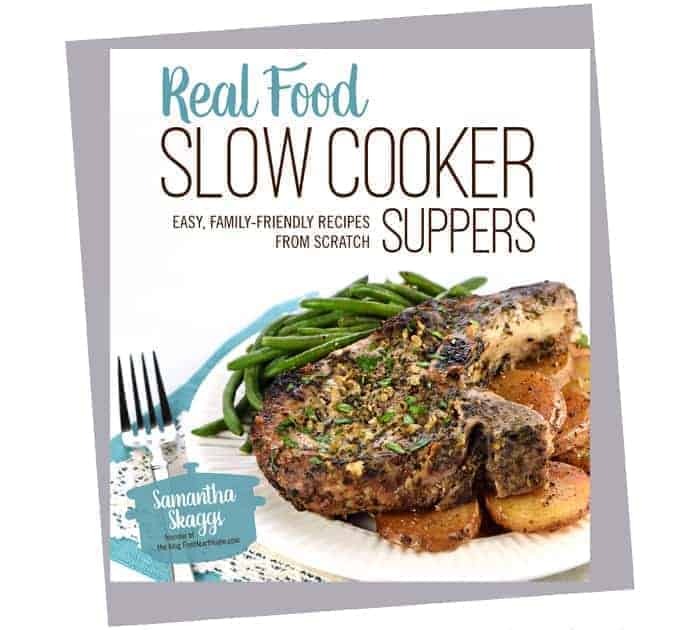 If you would like to feature this recipe, please rewrite the directions in your own words and give proper attribution by linking back to this blog. As far as this Texas gal’s preferred college teams, I have to admit that I do cheer for the Aggies over the Razorbacks…but I also prefer the Razorbacks over the Longhorns. SEC all the way! Ha. 😉 Hope you had a great Easter…thanks for the comment! I had to pop over to the chicken salad. I love chicken salads. This is a quite a creative one and I LOVE it. I had to pin it. Light and delicious The orange segments for the fruit part of the chicken salad–inspired. I don’t normally talk about ME, but please take note of the slight name change. New web design too—whoopee and adding some new features along the way. 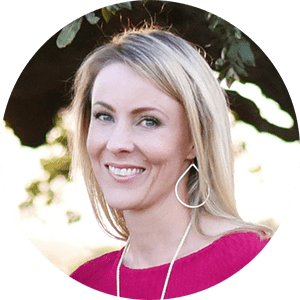 How exciting on your blog changes, Carol…congrats! I will definitely check out your revamped site when everything is done. 🙂 And as for this chicken salad, YES! It’s definitely light and lovely and yummy. 🙂 Thanks so much for the pin and hope you have a great weekend!